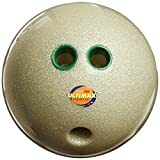 Ultimax 4 lb Bowling Ball featuring a traditional three finger pattern offers comfortable and controllable grip and release for a successful bowling experience. Ball assures perfect weight, roundness and official bowling ball size. Sold individually. Comes in a Gray Glitter Color.